In Doom’s Battleworld, there is only… Secret Wars!!! 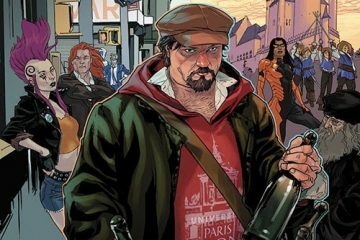 Marvel’s universe-shattering mega-event is well-underway, and this week sees the first set of all-new, all-different series and mini-series spinning out of it. Spearheading the new catalogue of exciting new series is Marguerite Bennett and G. Willow Wilson’s A-FORCE #1, the uber-hyped all-female Avengers-esque spin-off. Early previews for the first issue showcased fan-favorite female superheroes like Captain Marvel, Dazzler, Nico Minoru, and Ms. America Chavez fighting giant f**king sharks. From there, it just gets more awesome as Bennett & Wilson (and their corps of A-list artists) deliver one of the most dynamic, promising new series of recent months! The premise of A-Force is pretty straightforward: She-Hulk is the Baroness of Arcadia, an island nation in Battleworld, and she is responsible for the safety and security of her people. 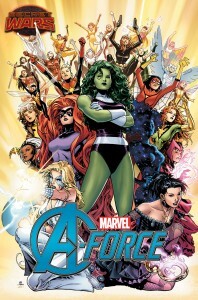 To defend Arcadia, She-Hulk has an all-star team of lady defenders (hence the “A” in A-Force) which includes the aforementioned Captain Marvel, Dazzler, Nico (as Sister Grimm), and Ms. America as well as more popular characters like Jean Grey (all Phoenix-ed out), Pixie, Spider-Woman, Medusa, Monica Rambeau, and Storm. Also present is the ever-spectacular Lady Loki from J. Michael Strazcynski’s epic run on Thor from a few years ago. The relationships between these characters are made quickly evident through the dialogue and some wonderful character captions, so fans unfamiliar with them will get a good handle immediately. I do want to point out that Arcadia is no Themyscira, the Paradise Island of the Amazons, from DC; it is very evident that men and women and children inhabit Arcadia and She-Hulk’s team is set up as the defenders of the Arcadian people. It just so happens they’re all female; there is no gimmickry here. The plot hinges on the previously mentioned confrontation with the giant shark. During the fight, one of our heroines makes a “mistake” which puts her at odds with the Thors, the guardians of the law in Doom’s Battleworld. As a result, one of the Thors comes to Arcadia (who the Thor is makes for a wonderful reveal about midway through the book! One of the coolest parts of Secret Wars is seeing some of our favorite characters in new and exciting roles) and demands that this heroine be apprehended and escorted away. She-Hulk is forced to make some tough calls, and it is in these scenes that the complex relationships and politics of both Battleworld and Arcadia are clearly presented. I don’t want to get into the plot too much because Bennett and Wilson are able to cover a lot of ground and introduce a lot of characters in this first issue alone, and I’m very excited to see where the series goes in the coming months. Jorge Molina, Craig Yeung, Laura Martin, and Matt Milla make for an excellent art team. Reminiscent of the explosive, cinematic artwork of Olivier Coipel and Stuart Immonen (both of whom have worked with Laura Martin and Craig Yeung several times), the visual aesthetic of A-Force is the perfect blend of dynamic realism and kinetic action. The splash pages are filled with detail and power; the quieter character beats are handled with care and precision. It’s also wonderful to see all of these female superheroes in the same panel, though I am a bit surprised to see Dazzler in her wildly preposterous Disco Queen outfit (classic, I suppose?). My only real issue with the visuals in A-Force is that there are some inconsistencies in background characters and detail—some panels feature an odd heroine or two that receive little to no follow-up and/or disappear in the next panel. In other instances, some of the background detail falls into Chris Bachalo-mode, where faces are filled in with three lines rather than an actual mouth and eyes. It’s slight, but it is noticeable on a few pages. BUY. Some minimal art inconsistencies aside, A-Force #1 is an exciting, promising debut issue from not one but two of the industry’s rising writers. Wilson and Bennett let loose in the anything-goes world of Secret Wars and, as a result, give us all of our favorite superheroines in a big, bombastic, balls-to-the-wall story in true Marvel fashion!!! Excelsior!! !